Citation Information: J Clin Invest. 2011;121(6):2422-2426. https://doi.org/10.1172/JCI45027. Assessment of Ghr excision and expression in βGHRKO mice. (A) Isolation of the islets from pancreas by laser capture microdissection. Original magnification, ×10. (B) PCR analysis of GHR excision in different tissues of βGHRKO mice using primers S6 and R2 (see Supplemental Figure 1A). LL, mice homozygous for the floxed Ghr allele; LLc, βGHRKO mice; WWc, RIP-Cre transgenic mice; I, islet; Exo, exocrine; P, pancreas; H, hypothalamus; S, spleen; L, liver. “L” arrowhead indicates the floxed allele, “W” indicates the wild-type allele, and “–” indicates the recombinant allele. (C) Immunofluorescence analysis of GHR protein (red) and insulin (green) in pancreatic sections. (D) Immunofluorecence analysis of Cre (red) and insulin (green) in pancreatic sections. (E) Gene expression of Ghr and the Cre transgene in islets analyzed by real-time PCR. *P < 0.05. 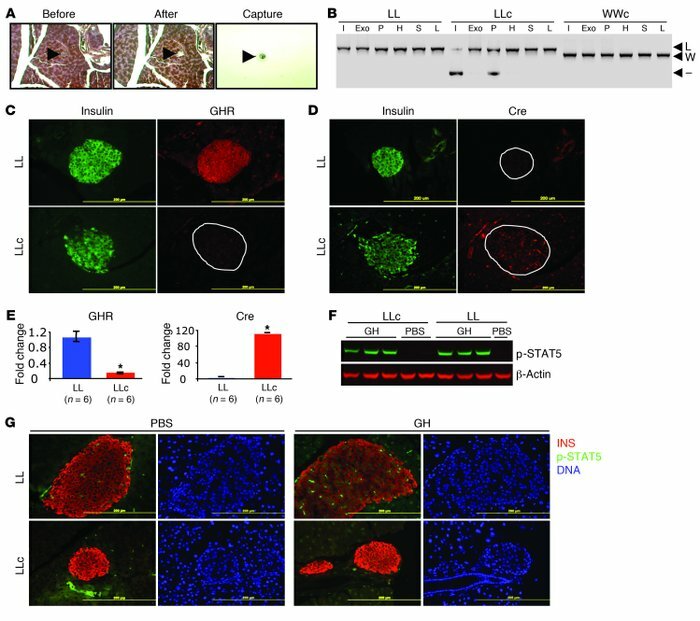 (F) Phosphorylation of STAT5 in liver upon intravenous injection of GH to obese control and βGHRKO mice, as assessed by Western immunoblotting. (G) Immunofluorecence analysis of phosphorylated STAT5 protein in pancreatic sections from obese mice (insulin [INS], red; pSTAT5, green; and nucleus, blue). Scale bars: 200 μm (C, D, and G).